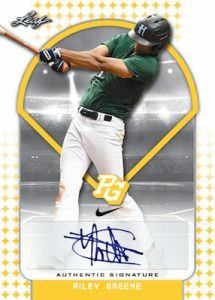 2018 Leaf Perfect Game National Showcase - Baseball Card Checklist	Overall rating:	3	out of 5 based on 1	reviews. 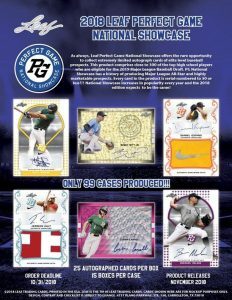 2018 Leaf Perfect Game National Showcase Baseball is a product that focuses on high school atheletes who are preparing for the 2019 MLB draft. For fans of the game this is an opportunity to jump on cards of young players early, in the hopes of finding the next superstar. 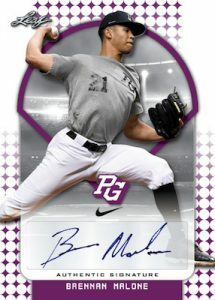 This is an all autographed product, with each hobby box offering 25 autographs, most of which are numbered. This is a limited product release, with only 99 total cases being produced.